According to data from the North Carolina State Board of Elections and Ethics Enforcement released on October 25, voters have cast 809,545 ballots at Early Voting sites since the start of this year’s 18-day Early Voting period. As stated in Democracy NC analyses for the first day and first weekend of Early Voting, there is no perfect election to use for comparison. The chart below compares this year’s vote totals to the totals from the 2014 and 2016 elections after one week of early voting. It is important to note, however, that the 2018 total is the result of eight days of Early Voting due to 2018’s unusual Wednesday start. After the first week of Early Voting in 2014, which was only a 10-day period, 691,510 ballots had been cast. Today’s totals for 2018 account for 74% of the number of ballots cast during the entire 2014 EV period. Much of the growth is due to white voters, but there are also significant increases in turnout among smaller demographic groups, like Asian voters and youth. Due to this year’s 18-day cycle, voters have 10 more days to cast ballots at Early Voting sites. After the first week of 2016’s 17-day cycle, 883,718 ballots had been cast. Following reports of spikes in registration among the youngest voters this summer, voters under 26 (32,886) have cast 70% more ballots at Early Voting sites so far this cycle than at this point in 2014 (19,334). The pattern holds true across racial lines. At this point in 2014, voters under 26 accounted for 2.8% of the ballots cast. This year, voters under 26 have cast 4.1% of all ballots at Early Voting sites. Across the state, 21% more white voters (597,642) have cast ballots at Early Voting locations than at this point in the 2014 cycle (494,630), which exceeds the 4% growth in the number of registered white voters since that time. White voters under 26 have cast 78% more ballots (21,299) compared to this point in 2014 (11,933). Across the state, 20% fewer Black voters (165,144) have cast ballots at Early Voting locations than at this point in the 2014 cycle (175,374), while the number of registered Black voters has grown 4% since 2014. However, 10 days remain in the 2018 cycle, while only three remained at this point in 2014. Black women voters are down 6% from 2014 numbers: 101,069 ballots have been cast so far at Early Voting sites in this cycle, compared to 107,902 at this point in 2014. Black voters under 26 are 3% above 2014 numbers. So far in 2018, 3,778 Native American voters– a 71% increase from this point in the 2014 cycle– have cast ballots, which soundly surpasses the 8% growth in voter registration. Today’s numbers account for 94 percent of the total number of Early Voting ballots cast by Native American voters in 2014. 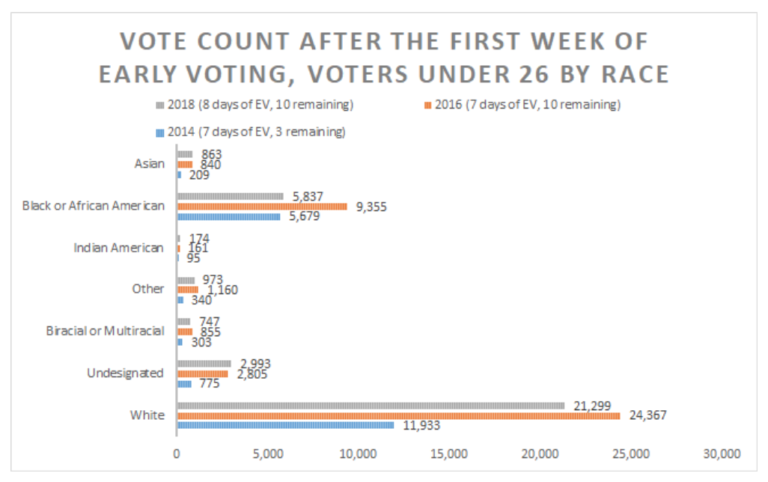 Eighty-one percent more Biracial and Multiracial voters have cast ballots at Early Voting locations (3,281) this cycle compared to this point in 2014 (1,813). The number of registered Biracial and Multiracial voters has increased 22% since 2014. 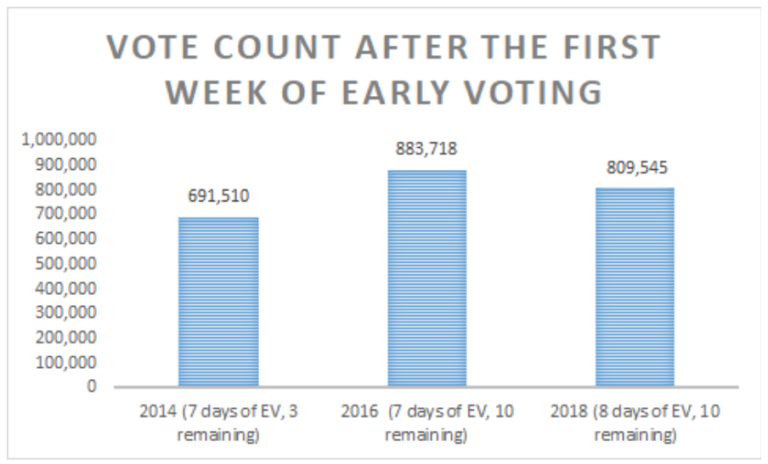 The number of Asian voters who have cast ballots during Early Voting in 2018 (6,895) now exceeds the number cast during the entire Early Voting period in 2014 (5,268), with 10 days remaining. More than double the number of Asian voters have cast ballots at Early Voting locations this cycle compared to this point in 2014. The number of registered Asian voters has increased 42% since 2014. Asian voters under 26 have cast quadruple the number of ballots in 2018 (863) compared to this point in 2014 (209), and are roughly on par with 2016 numbers (840). Democratic voters’ numbers are on par with 2014’s numbers, while Republican and Unaffiliated voters’ numbers are up. Democratic voters are roughly on par with 2014 numbers. So far, 349,891 Democrats have cast ballots at Early Voting sites, compared to 338,521 in 2014. However, the 3% decrease in registered Democrats in that time makes the 3% increase in ballots hold more weight. Democratic women have cast 4% more ballots (209,565) compared to this point in 2014 (201,267). Republican voters are up 15% (245,132 ballots) compared to this point in 2014 (213,245). The number of registered Republican voters in North Carolina has increased 5% since 2014. Republican women have cast 15% more ballots (119,870) compared to this point in 2014 (104,196). 53% more Unaffiliated voters have cast ballots at Early Voting sites in 2018 (212,572), compared to this point in the 2014 cycle (138,744), which surpasses the 23% growth in registered Unaffiliated voters in that time. Unaffiliated women have cast 55% more ballots (100,206) compared to this point in 2014 (64,744). Sixty-five of North Carolina’s 100 counties have seen more voters this cycle than at this point (after the first week) in 2014. A third of North Carolina counties have seen a reduction of 100 or more ballots in the number of Black voters compared to this point in 2014. The counties with the greatest decreases in the number of Black voters are Mecklenburg, Guilford, Cumberland, and Cleveland Counties. Three-fourths of North Carolina counties (74) have seen an increase in the number of Early Voters under 26 compared to this point in 2014, with the greatest increase in the number of ballots in Wake, Durham, Mecklenburg, Buncombe, Watauga, Orange, and Jackson Counties– all of which are home to colleges and universities. Challenges remain for voters in some hurricane-impacted counties, which was recognized by the State Board of Elections last week in an order which added accomodations for storm-affected voters. Of the 35 counties where fewer ballots have been cast compared to this point in 2014, 19 of them are receiving federal assistance in the aftermath of Hurricane Florence. Only five counties have a deficit of over 1,000 votes compared to this point in 2014, and four out of those five are receiving federal assistance due to Hurricane Florence. Of the ten counties with the largest percentage decrease from this point in 2014, six of them are receiving federal assistance in the aftermath of Hurricane Florence. Of the fifteen counties with the greatest decreases in the number of Black voters compared to this point in 2014, seven are receiving federal assistance due to Hurricane Florence. Of the ten counties with the most registered voters, voter turnout was up in 9 of them compared to 2014. The only exception, Cumberland, is barely below 2014 numbers and is one of the 28 counties receiving federal assistance in the aftermath of Hurricane Florence. Across the state, Wake, Durham, Mecklenburg, Buncombe, and Forsyth have seen the greatest increase in voters since 2014. Durham, Forsyth, Robeson and Wake counties have seen the greatest increases in Black voters.